Welcome to GateWay Kid’s Ministry! We have 5 programs for all ages to guide and teach children about God’s love, salvation and to train them in Bible skills and knowledge! All children are welcomed by our trained and qualified volunteers into a fun and supportive environment. We welcome families from all over the county…from Watsonville to Boulder Creek. We hope to meet you soon! Teachers & Helpers – Lindsey Morton, Amber Britt, Claire Skinner, Josh & Chelsea & Sunny Passmore, Ray & Connie Fransen, Emily Yanez, Jennifer & Noel & Dominic Osorio, Cynthia & Natalie, Nadine Lofstrom, Kirsten Maure, Molly, Ingrid Lanoue, Melody Seiley, Sonja Cruz, Nadia Kvamme, Valerie & Caden Peet, Maya & Elisha Enns, Mike & Sally Kennedy, Jennifer Buehler, Jennifer Craig, Monica Aldana, Laura, Perry Knorr, Steve Esparza, Hanifa. What will my child be doing in Sunday School? All children are welcomed by our trained and skilled volunteers. After a time to play in the room, children will be engaged in prayer, worship, Bible teaching and various fun activities and games to reinforce the teaching. Children will learn about events from the Bible and the many things God has done to reveal His love and plan for each person. We use video & live teaching and illustrated books or demonstrations to share truth from God’s Word, the Bible. How large are your class sizes? How many teachers lead each group? We have 2 teachers/helpers for each age group. Our High School and Jr. High students also like to come in and help the adult leaders. The average class sizes are as follows: Nursery (1-6 babies), Toddlers (4-10 children), Preschool (4-12 children), lower elementary (8-16 children), upper elementary (10-15 children). Our class sizes allow our volunteers to give each child individual attention and care. 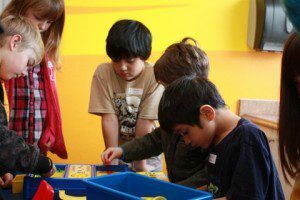 How are volunteers chosen to serve in kid’s ministry? All children’s ministry workers are committed GateWay attendees who have either been asked to serve or who have volunteered to serve. All volunteers are run through a Megan’s Law background check and are asked to fill out a volunteer form (which includes personal references and other background screening information). All volunteers are trained and most serve once per month or more. Our nursery welcomes babies aged 6-24 months. Our trained staff take turns serving 1-2 times per month. Our adult and high school volunteers must all fill-out a volunteer application, be trained and pass a background check. Our toys are washed on a regular basis and we keep a supply of sippy cups, cheerio snacks, baby food, changes of clothes, and different sized diapers on hand, but always appreciate when parents leave a diaper bag with their child’s specific needs. Our toys and supplies are age-appropriate and safe. To check in, all parents are required to sign their child in and out and take a call # tag. If we should need you during the worship gathering we put your call # up on the screen so that you can return and assist your child. You must also bring your call number back when you pick up your child. While your baby is with us in the nursery our goal is to engage them in play, music or by reading stories so that they feel safe, secure and happy. We want you to be able to attend the worship gathering without feeling anxious or worried. If parents are nervous about leaving their child, they are invited to stay with us in the nursery. Parents are always welcome in our nursery. Additionally, we require that only our adult or older high school female volunteers change diapers. If you are new to GateWay we will ask you if you would like us to change your child or if you would like us to call you in to do so. We want to make sure you and your baby have an excellent time with us here at the GateWay Nursery. We welcome you to our nursery and hope that you will come visit us soon! 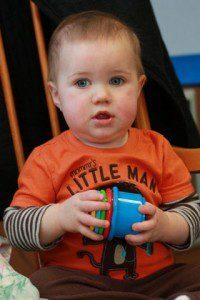 Our toddler program welcomes little ones aged 2-3 years. Our trained staff take turns serving 1-2 times per month. Our adult and high school volunteers must all fill-out a volunteer application, be trained and pass a background check. Our toys are washed and sanitized on a regular basis and are always age-appropriate and safe. Our children eat a snack of goldfish crackers or animal crackers and water each Sunday. 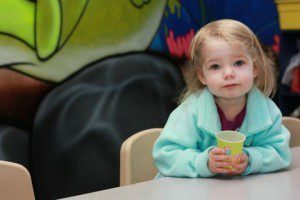 While your child is with us in the toddler program our goal is to provide a safe and fun environment. We will engage your child in live and interactive Bible teaching and help reinforce what we learn through fun games and crafts. 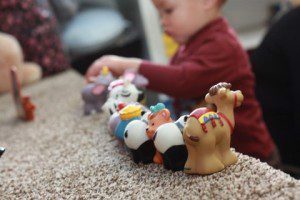 If parents are nervous about leaving their child, they are invited to stay with us in the toddler room to help their child adjust and to observe what we are all about in the toddler program. Our toddler bathroom is located inside of our classroom and it is helpful when parents tell us that their child is potty training. We are glad to assist your child in any way that you would like us to. Additionally, we require that only our female volunteers change diapers or assist children in the bathroom. If you are new to GateWay we will ask you if you would like us to change your child/take them to the bathroom or if you would like us to call you in to do so. We want to make sure you and your child have an excellent time with us here in the GateWay toddler program. 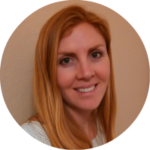 We look forward to getting to know you and your toddler soon! Calling all 4 year-olds and kindergartners! Our trained staff take turns serving 1-2 times per month. Our adult and high school volunteers must all fill-out a volunteer application, be trained and pass a background check. Our classroom is equipped for safety and fun. We have a castle to climb on, a play kitchen and puppet theater, as well as lots of other age-appropriate toys. Children are given a snack of goldfish crackers or animal crackers and water each Sunday as well. To check in, all parents are required to sign their child in and out on our clipboard. Security and safety are top priorities here at GateWay and our volunteers will not let your child leave Sunday School unless his hand is in yours. Our Kingdom Kids room is equipped with a bathroom so that children will not have to leave the room to use the restroom. Children will be helped in the restroom only if requested by the parent and then, only our female volunteers are allowed to do so. While your child is with us in Kingdom Kids he will be taught a Bible lesson using live or video teaching. 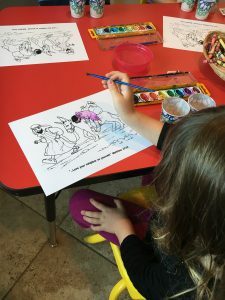 Children are also engaged through small group discussion, prayer and with activities and crafts to help them learn Bible truths in a fun and kid-friendly way. If parents are nervous about leaving their child, they are always invited to stay with us in the classroom to help their child feel secure and to observe what we do in Sunday School. We want to make sure you and your child have an excellent time with us here at GateWay so please don’t hesitate to contact the children’s director with any questions. We look forward to seeing you soon in Kingdom Kids! All 1st-3rd graders are welcome! Our trained staff take turns serving 1-2 times per month. Our adult and high school volunteers must all fill-out a volunteer application, be trained and pass a background check. Our classroom is equipped for safety and fun. From shooting hoops in our mini basketball hoop, to pictionary on the white board and tons of fun board games, these kids have fun in Sunday School. Children are given a snack of crackers and water each Sunday as well. To check in, all parents are required to personally drop off and pick up their child with the adults in charge. The classroom leader will ask you to sign your child in and out on the clipboard and get your child a name tag. Security and safety are top priorities here at GateWay and our volunteers will not let your child leave Sunday School unless you are with him. Our classroom is equipped with a bathroom so that children will not have to leave the room to use the restroom. While your child is with us he or she will be taught a Bible lesson to explore and apply through small group discussion, prayer, activities and games. They will learn Bible truths in a fun and kid-friendly way. If parents are nervous about leaving their child, they are always invited to stay with us in the classroom to help their child feel secure and to observe what we do in Sunday School. 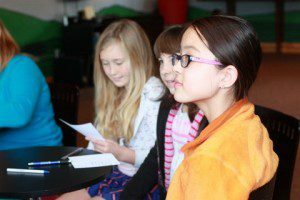 Our oldest kid’s program is for 4th & 5th graders! Our trained staff take turns serving 1-2 times per month. Our adult and high school volunteers must all fill-out a volunteer application, be trained and pass a background check. Our classroom is equipped for safety and fun. We have a rock climbing wall, tire swing and even a great Wii system. To check in, parents are asked to drop off and pick up their child personally by signing them in and out with the room leader. For fun, kids sign in with our “question journal” each Sunday and the classroom leader marks them off on the roll sheet. 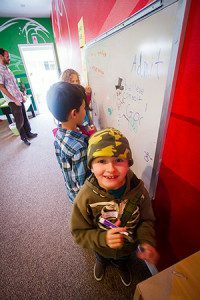 Kids are each given a name tag and encouraged to learn a memory verse each week for a chance to win a prize. While your child is with us in Edge he or she will be taught a Bible lesson by our faithful Bible teachers. This live teaching is done in a fun and interactive way with object lessons, activities and lots of Q&A. Children are engaged through group participation and with games/activities to help the Bible truths sink in. We spend time in prayer and worship as a group. We want to make sure you and your child have an excellent time with us here at GateWay so please don’t hesitate to contact the children’s director with any questions! Bring a friend and we’ll see you soon in Edge! We want our 6th-8th graders to experience God on a level that they can truly understand while affirming their personal faith journey. That’s why we call it, “Real Life.” We are helping young people see how God can transform their heart, soul and mind challenging them to own their own faith and see the value in a faith community. We believe Jesus is the greatest thing to ever happen to the human race. At Amplify, we want to say that in a way that speaks much louder than all of the negative messages that students are hearing today. That’s why we call it Amplify. We hope you’ll visit on Sunday or Wednesday to experience genuine friendship in a place where students are welcome no matter what their faith background has been. Winter Camp 'Snow Rush' videos!